Kent is grown all over the American continent, primarily in Mexico, Ecuador and Peru. It is also grown in California. 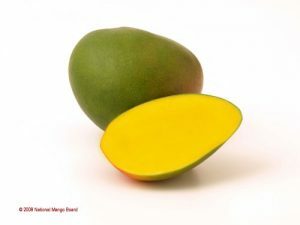 This is also a large mango, which has a Greenish skin with a dark red blush and yellow dots. When ripe, it tends to be Juicy, vibrant and tender. It was developed in Florida in early 1900’s, and is a descendant of the of the Sandersha seedling. The Sandersha seedling comes from Saharpur, India from a variety named Sundershah. It is available from January to March and from May to August.